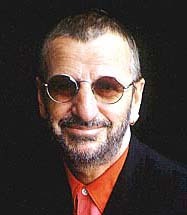 Richard Starkey Jr. was an only child of English working-class parents. His father left the family when Ringo was three, and young Starkey endured a somewhat sickly childhood with recurring bouts of tuberculosis. He got his first set of drums at 13, and dropped out of school at 15. After that, Starr worked as a delivery man and drummed for Rory Storm & The Hurricanes. He was hired to replace drummer Pete Best as the fourth and final Beatle, and alongside John Lennon, Paul McCartney, and George Harrison. Despite the band's phenomenal success, Starr has been described as a merely adequate drummer. He sang on only a handful of their songs -- "Yellow Submarine", "With a Little Help from My Friends" -- and wrote only two of their songs, "Octopus' Garden" and "Don't Pass Me By." After the Beatles broke up, Starr had solo hits including "It Don't Come Easy", "Photograph", "You're 16", and "Oh My My", while doing the occasional light acting. He narrated the delightful Harry Nilsson cartoon The Point, then produced Son of Dracula film starring Nilsson as the Count and Starr as Merlin the Magician. Starr co-starred in Mae West's last film, Sextette, and starred in the Caveman with Dennis Quaid, Shelley Long, and Barbara Bach. Bach and Starr were married in 1981. He played the Mock Turtle in a 1986 BBC telemovie of Alice in Wonderland. He was the train's conductor on Shining Time Station in 1990 and 1991, until he was replaced by George Carlin. Starr tours with his All Starr Band, with a varying lineup that has included Peter Frampton, Jack Bruce, Colin Hay, Paul Carrack, Mark Rivera, and Sheila E, as well as Ringo's drummer son Zak.